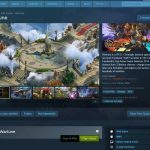 Hey guys, there are actions in place to get Wartune on the Steam Platform and the Wartune Team needs support from all players to vote “Yes!” for this to happen, which I also think would be great for Wartune and all the players because it would bring in more players, more competition, more discussions and, of course, more profits which can be invested into more new game features for everyone to enjoy. You can vote by going to this Steam page – click here. The voting buttons are right under the videos/screenshots. You can also add to favorites and/or follow the projects. Update: thanks for everyone who pointed out, it seems you need to have a Steam account to vote; as I already had one I did not realize that. What is the Steam platform? In short: Steam is a huge and popular gaming platform which has and sells many games. There are a lot of players on Steam, so when any game is added to their platform that naturally there would be an influx of a lot of new players. If we get 10000 yes votes on Steam, we will send these rewards to all servers: Gold*3,000,000，Mahra*150，Sylph Sepulcrum*150，Fashion Core*100，Good Luck Charm*100. So ya, overall a benefit to everyone with more activity, gifts for players, profits for Wartune, etc – everyone wins, so it is our, DolyGames, suggestion as well to vote “YES!” to make this happen. One additional piece of information which may be important for current Wartune players: I have received confirmation that transfer of current Wartune accounts to Steam Platform will unfortunately not be possible. 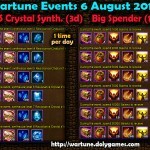 However, since there are overall benefits to everyone also the support of current Wartune players is needed so please vote. Just a little accuracy, we need a steam account for voting. Thx for your website! there is a lot of precise and precious informations. eh, but i must have an account in steam for vote… and who remember it? i hate do new accounts XD . but i gain anyway the rewards without vote? I’d be done. Not about to start from scratch and lose all the money and work i’ve put in to my toon. I think the reason why is because you have to spend at least $5 on the steam account to be able to do that. Not wasting my time and effort on that. Plz don’t vote.this game never honoured his players. somany ppls quit out of frustration.after seeing the rewards they offer for those yeses.its a big NoNo frm me.atleast let them deserve or earn it.Btw cosmos if u forgot even u also had hard time with publisher including sym. meant shut down by area. sorry if i wasn’t clear. r put it any other light – If both adobe flash/fb and steam versions of the game exist. why would the devolper put any many in the old tech. 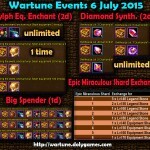 I’m not interested in helping Wartune in any way. I still play to kill time (not spending a single cent anymore! ), but I don’t give a damn about the game or its developers/retailers, just as they didn’t give a damn about us. I won’t vote and advise you not to as well. The last thing I want to see if more players joining this scam fest. Sorry, but I am a bit confused here…If they are not letting players move over, then EVERYONE starts from zero? Once they would get a solid base of players on Steam, how much resources do you think they would continue to put into the old game? They do a thoroughly inadequate job of testing new stuff before releasing it here now. I was excited about the knighthood until I read how much it would cost in balens not to mention all the advanced henna to even start it. Now it seems totally pointless except for a few very rich players. Something else to make game play totally imbalanced. This has a small chance of making wartune better or at least we get a bit of a reward so no reason not to vote yes if you have a valid steam account( had spend some money on it at some point). If it all fail who cares, im not gonna play it on steam. we restrict access to certain community features until an account has spent at least $5.00 USD in Steam. after creat acc on steam need use money to can vote yes ? just for curiosity, ¿what is the name of the game? I think you need to do some editing to the last paragraph. Some players are reading this as if kabam and kong are going away and you have to start over on steam because they won’t transfer the toons.